The EL5152 EL5153 EL5252 and EL5455 are 270MHz bandwidth -3dB voltage mode feedback Amplifiers with DC accuracy of <0.01%, 1mV offsets and 50kV/V open loop gains. These Amplifiers are ideally suited for applications ranging from precision measurement instrumentation to high-speed Video and monitor applications demanding higher linearity at higher frequency. Capable of operating with as little as 3.0mA of current from a single supply ranging from 5V to 12V dual supplies ranging from 2.5V to 5.0V these Amplifiers are also well suited for handheld, portable and battery-powered equipment. Single Amplifiers are offered in SOT-23 packages and duals in a 10 Ld MSOP package for applications where board space is critical. Quad Amplifiers are available in a 14 Ld SOIC package. Additionally, singles and duals are available in the industry-standard 8 Ld SOIC. All parts operate over the industrial temperature range of -40C to +85C. This is one package pinout of EL5252,If you need more pinouts please download EL5252's pdf datasheet. 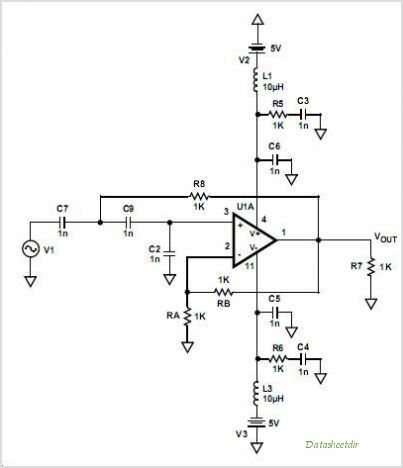 This is one application circuit of EL5252,If you need more circuits,please download EL5252's pdf datasheet.